Watford XI: Gomes, Paredes, Britos, Cathcart, Holebas, Capoue, Watson, Behrami, Jurado, Deeney, Ighalo. And that is that. Both teams end a run of defeats and a draw is, as they say, a fair result. Gareth Barry with a glancing header which Heurelho Gomes gathers. It's all happening in these final minutes. Watford immediately on the attack, end-to-end stuff, Odion Ighalo with a strike which doesn't trouble Joel Robles. A wonderful diving save from Joel Robles. Ben Watson's strike from distance is deflected off John Stones and the Everton keeper acrobatically keeps his team in the match. There will be four minutes of added time and Watford are on the front foot. Nervy times for Watford. Ben Watson punished for a foul on Kevin Mirallas and the visitors have a free-kick in a tasty position three minutes from time. Mirallas steps up and finds Romelu Lukaku who scoops his shot across goal and off the bar. That was close. Five minutes of the 90 minutes remaining and the match is opening up somewhat. Substitute Kevin Mirallas with oodles of space down the right, Everton sensing an opportunity, but Watford's defence is holding firm. 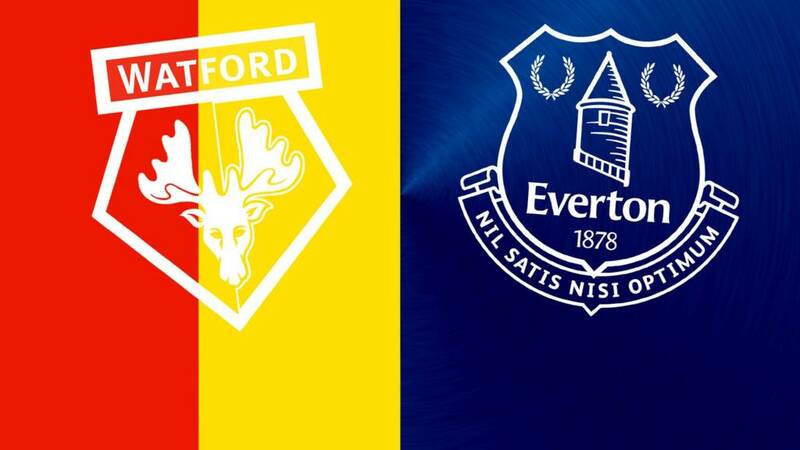 Odion Ighalo races forward, but Phil Jagielka and John Stones stop the Watford man in his tracks, much to the dismay of the home supporters who think he's been brought down illegally. Stones to the fore when danger lurked. Etienne Capoue hobbles off the pitch but it looks like he will be ok for the rest of the match. Everton make a substitution, bringing on Kevin Mirallas for Gerard Deulofeu. A timely tackle from James McCarthy, stopping Etienne Capoue in his tracks as he cut into the box. Everton surge forward, but Capoue is still on the ground. The ball goes out of play and the Watford midfielder can finally receive some medical attention. For possession it's been all Everton in these last five minutes. Romelu Lukaku becoming more of a menace, Gerard Deulofeu getting plenty of the ball on the right. Everton spraying the ball around nicely. Romelu Lukaku with a cute backheel for Aaron Lennon to pick up on the edge of the box and the former Tottenham man's low strike forces a diving save from Heurelho Gomes. John Stones with a hopeful hoof forward which sends Gerard Deulofeu scampering but the forward's cross comes to nothing. Moments later it's Watford's turn to attack, a timid cross from Juan Carlos Paredes which Everton's defence deals with easily. Tom Cleverly comes on against a team he once played for and takes the place of Ross Barkley. Are those boos I can hear? Maybe I'm hearing things. Gareth Barry is gesticulating at the referee. The midfielder has conceeded a free-kick for barging into Troy Deeney. The Watford captain is getting a lot of attention. It's a half of little excitement - but, hang on, there's a substitution! Watford with another free-kick on the fringes of Everton's box. Phil Jagielka this time penalised for fouling Troy Deeney. A poor effort from José Holebas, though, too much swing and too much height. Everton on the break. Romelu Lukaku feeding Gerard Deulofeu. The Belgium striker seems to be thwarted in his attempt to sprint on in support of his team-mate. Nothing's given and Deulofeu messes up an opportunity to test Heurelho Gomes. Thirty minutes remaining. Romelu Lukaku has been more of a menace in this half than he was in the entire first half. Lukaku's touches so far in this match.Image caption: Lukaku's touches so far in this match. Aaron Lennon with acres of space to run into, no Watford player is keen to close him down. Heurelho Gomes parries the winger's low shot, Romelu Lukaku senses an opportunity to pounce on a free ball but the Watford goalie, sprawled on the floor, palms the ball to a team-mate before the Everton striker can get close enough. Everton threaten. Leighton Baines crosses in from the left, the ball bobbles beyond a couple of Watford players and falls to Gerard Deulofeu. The Spaniard dances, plays a one-two with Aaron Lennon before snatching his shot wide. Romelu Lukaku, absent in the first half, darts across goal in a bid to catch Gerard Deulofeu's through ball, but Watford's defence hold firm. I'd forgotten the Belgian was on the pitch.